Dory and Nemo, of course, are kiddie-fave characters in FINDING NEMO, the 2003 icthyic fantasy from the digital magicians at Pixar, whose fertile imaginings generated such previous hits as TOY STORY, MONSTERS INC. and A BUG'S LIFE, all sprightly, thoughtful, eye-filling and inventive all-ages whimsies that hark back to the days when Walt Disney's signature on a flick guaranteed a good time for parents and children alike. Even buying the inevitable plastic-injection-molded Buzz Lightyear made-in-China action figure became a ritual less onerous for the rich pleasure the films provided. FINDING NEMO isn't a top-of-the-line catch in Pixar's nets, but it measures up. Its running time of 101 minutes, uncommonly long for the G-rated crowd, goes by swimmingly. Main problem is a formulaic kiddie-entertainment premise that stoops to the perennial Disney (and wannabe-Disney) opening gambit - joining the Dead Parent Society. Setting is the Great Barrier Reef of Australia, brought to full bloom via computer graphics. No sooner do we see blissful middle-class clownfish Marlin (voiced by Albert Brooks) and his finny spouse contemplate their brood of eggs than an offscreen barracuda attack leaves Marlin a widower and single-dadfish, nervously protective of one surviving egg. The egg grows into Nemo (voiced by Alexander Gould) a small fry hindered by a gimpy fin - so not only motherless but lame, got the pathos folks? - but determined to prove himself by going to "school" like all the other offspring of reef denizens. Taking adar to swim beyond the reef drop-off to open water, Nemo gets scooped by a scuba diver and taken to Sidney to reside in a saltwater aquarium in a dental office. The frantic Marlin swims after, far outside his comfort zone, through an ocean and coastline teeming with predators, on a seemingly hopeless quest to get Nemo back. Marlin hooks up with the addled Dory (voiced by Ellen DeGeneres), a friendly fish who suffers from short-term memory loss and can barely keep a thought in her head. Unlike Guy Pearce in MEMENTO, she's a chipper, oblivious nutcase who charges wide-eyed and optimistic into even the most dangerous of shoals. It is a wonderful characterization, even more so set beside Brooks' neurotic Marlin. 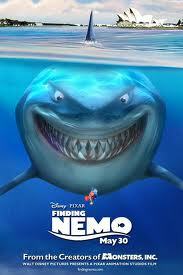 There do seem to be a lot of issue-ridden CGI cast members in FINDING NEMO. Besides the brain-damaged Dory, a couple of 12-step-program sharks lurk, and Nemo shares his prison with a tankful of stir-crazy captive fish, leader of which is the scarred, bitter Gill (voiced by Willem Dafoe), whose escape attempts are, relievedly, not reflective of WWII POW flicks (the stop-motion CHICKEN RUN mined that territory effectively). Some scattered satire plays well to grownups even as it goes over kids' heads. Whether Nemo is found or not is as predictable a conclusion as what happens to the orca in FREE WILLY, and writer-director Andrew Stanton - who voice-cameos as a surfer-dude sea turtle - strains credulity at times even in a whopper of a tale like this. Why should some fish-eating shore birds, pelicans, join the trans-species rescue effort while others, gulls, still seek to mindlessly gulp down our heroes. Oh forget it (Dory already did), disarm your cynicism and have a good time.